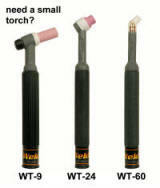 and the original TEC® brand of TIG welding torches. The TEC Welding Products Company, established in 1955, is the oldest independent TIG torch maker in the world. Its reputation for high quality innovative products is known and respected around the world. The Tec team has introduced more innovative products and has more patents for TIG welding torches and related products than any other company. Products are sold by welding equipment distributors worldwide. See what actual welders say about WeldTec TIG torches . .
in 27 years of welding"
i-HEAD¨, Heliweld IIª, overall shape and appearance of the Speedway Handleª, are trademarks of TEC Welding Products.